A large hopper at the back end is loaded with tablets, pills, or capsules. They come out the bottom and land on a set of vibratory feeder ramps which have multiple lanes on a very gentle and long incline. This machine has 10 lanes and the purpose of these lanes is to allow enough time for the tablet stream to serialize so that they are lined up behind one another just like dominoes all in a row as the end towards the end of the ramp. Once the pills get to the end of the ramp they start to fall off one by towards the bottle waiting below as they fall they pass through a pencil thin beam of light that extends like a thin plane across the entirety of the sensor hole. As the pills fall through they break the beam and send a count signal to a central processor that is monitoring all ten positions. As the bottles reach their count the feed lane to that bottle is shut down and cutoff until all ten bottles are full. 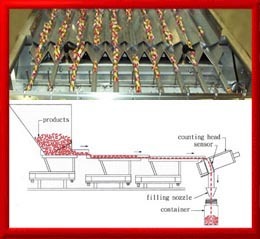 Finger stopper pistons on the long constantly running conveyor are withdrawn and the 1o bottles are allowed to come and another 10 are brought in and the cycle begins again. The 10 bottles that just left are brought to a casing station down at the other end of the conveyor. The process I described above sounds to be very slow, but it actually takes place at the rate of hundreds of bottles per minute. View the slide show to see and read more about it.